Ohaus Defender 7000 low profile is an advanced line of Precision Bench Scales with a durable ABS plastic T71P indicator, dual line alphanumeric display, totalization mode, 255 memory library, statistics print output, painted pressed steel base and dual scale operation with included remote base input for dual scale counting. The OHAUS Defender 7000 Series is a feature-rich line of bench scales, combining an ABS plastic T71P indicator with painted steel bases and mounting brackets. 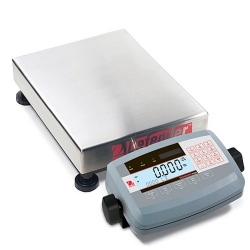 Ideal for shipping and receiving, production, packaging and general commercial and industrial weighing applications, the Defender 7000, available from Central Carolina Scale, offers a multifunctional indicator with multiple weighing units, alpha-numeric keypad and software modes to meet the requirements of industrial and lab applications. With rugged construction, comprehensive yet intuitive software and multiple connectivity options, the Defender 7000 can meet the needs of demanding industrial operations. Interface Options . . . . . . . . . . . . . . . . . . . . . . . . . . . . . . . . .
Other Accessories. . . . . . . . . . . . . . . . . . . . . . . . . . . . . . . .